We are excited to let you know about a new Long Term Player Development (LTPD) Technical program being delivered by Ontario Soccer. The objective of the Game Leader program is to allow for an improved, child friendly approach to supervising small sided games for children U6-U8 and creating more opportunities for parents to get involved. The Game Leader program has been designed by Ontaro Soccer Grassroots, Referee and Coaching departments. It is supported and endorsed by the Canadian Soccer Association. Enable children to have a fun and rewarding experience while competing in small sided games. Implement simplified rules while keeping the game moving -- limiting stoppages and assisting the young players with all restarts. 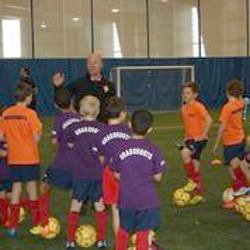 The Game Leader can be a club representative, coach, parent or a beginning or senior referee who has been selected by the club or district to participate in the Game Leader Instruction program. Completing the Game Leader training is very simple. The entire online process of watching the video, completing the quiz, printing your Game Leader Certificate and printing/saving your Game Leader booklet should take no longer than 35 minutes. A step by step process to guide you to a successful login and completing the course is available in the PDF below. The Game Leader program will become mandatory as of 2016 and replace the referee at all U6-U8 games. Download and read the "Game Leader Guidelines"